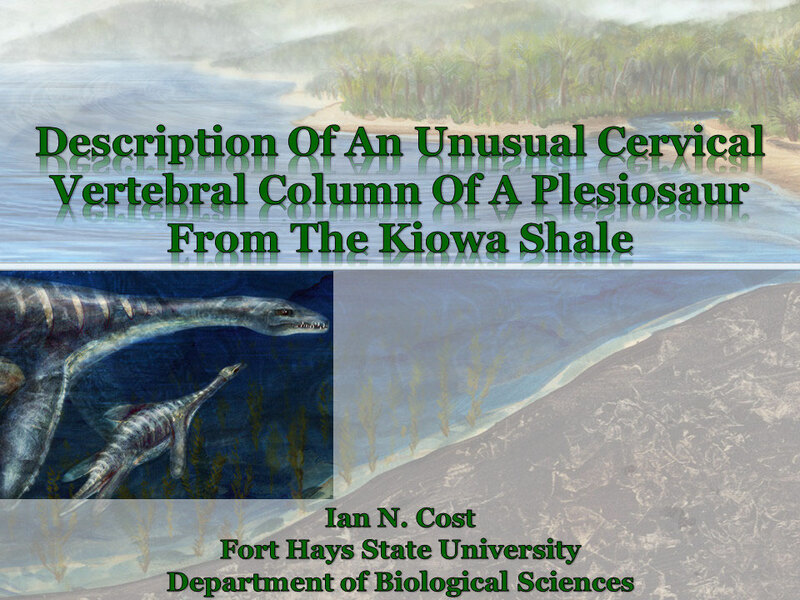 Publications will also be available on Research Gate as I am able to post them there. Gignac, P. M., Kley N. J., Clarke J. A., Colbert M. W., Morhardt A. C., Cerio D., Cost I. N., Cox P. G., Daza J. D., Early C. M., Echols M. S., Henkelman R. M., Herdina A. N., Holliday C. M., Li Z., Mahlow K., Merchant S., Müller J., Orsbon C. P., Paluh D. J., Thies M. L., Tsai H. P., and Witmer L. M. 2016. 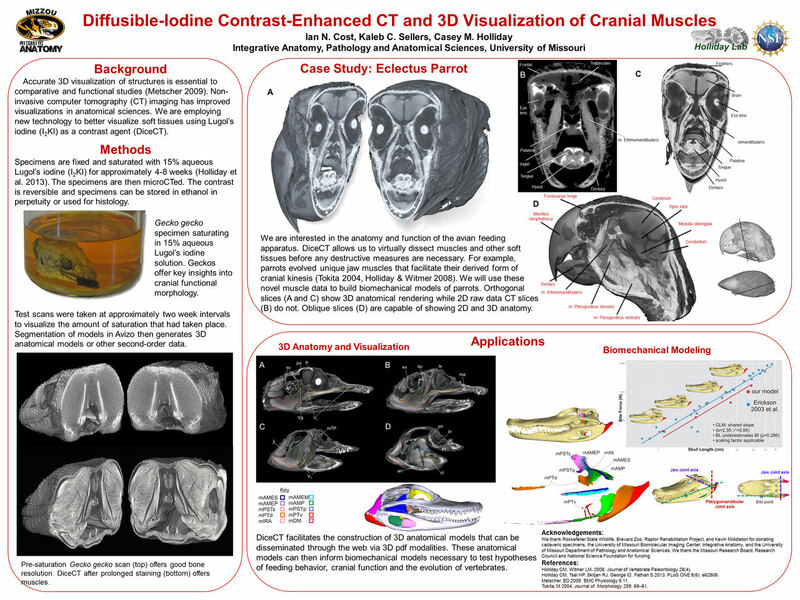 Diffusible iodine-based contrast-enhanced computed tomography (diceCT): an emerging tool for rapid, high-resolution, 3-D imaging of metazoan soft tissues. Journal of Anatomy. doi: 10.1111/joa.12449. Presentations that have been given and include cleared images can be enlarged by clicking on the thumbnails. Cost, I. N., Echols M. S., Middleton, K. M., Holliday, C. M. 2019. 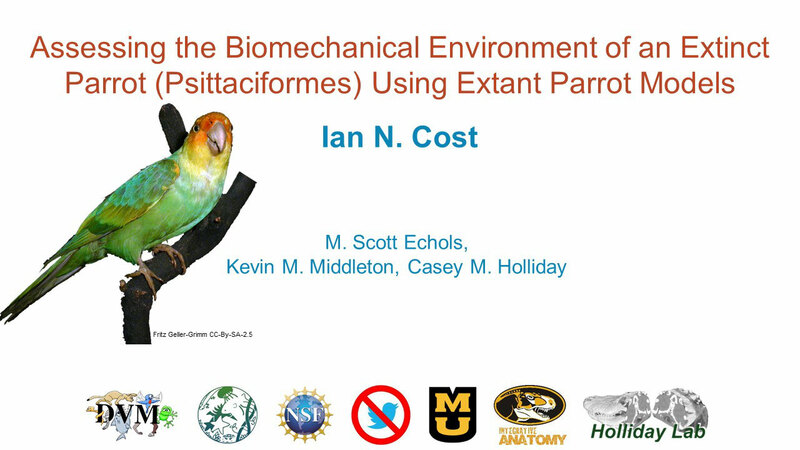 Assessing the Biomechanical Environment of an Extinct Parrot (Psittaciformes) Using Extant Parrot Models. Society for Integrative and Comparative Biology, Tampa. Cost, I. N., Sellers, K. C., Middleton, K. M., Davis, J. L., Witmer, L. M., Holliday, C. M. 2018. 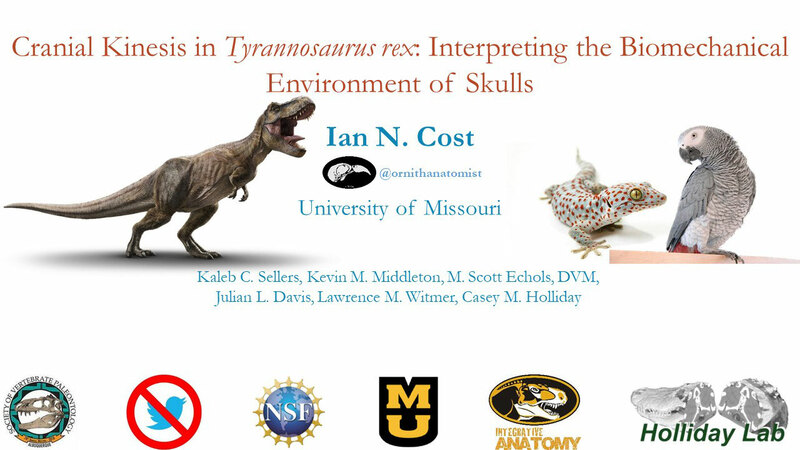 Cranial Kinesis in Tyrannosaurus rex: Interpreting the Biomechanical Environment of Skulls. Society of Vertebrate Paleontology, Albuquerque. Cost, I. N., Sellers, K. C., Davis, J. L., Middleton, K. M., Witmer, L. M., Holliday, C. M.; 2016. 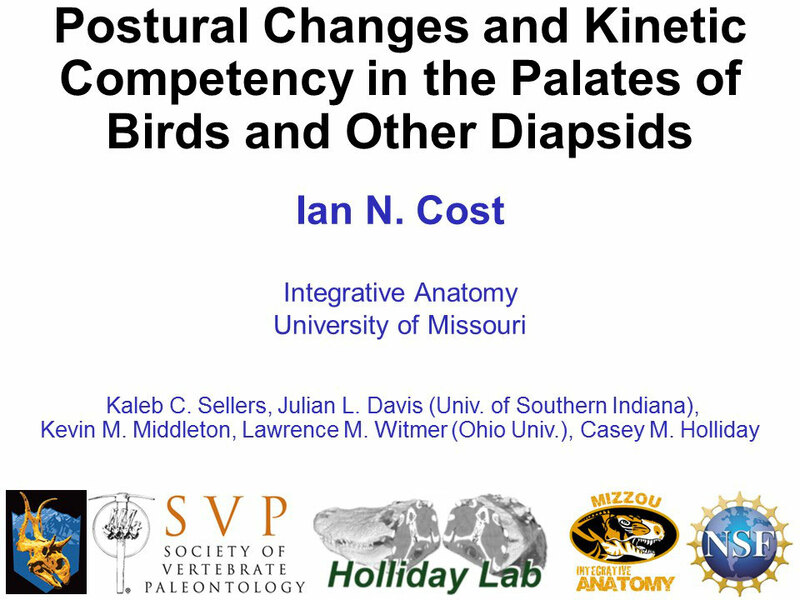 Postural Changes and Kinetic Competency in the Palates of Birds and Other Diapsids. Society of Vertebrate Paleontology, Salt Lake City. Cost, I. N., Spates, A, Sellers, K. C., Davis, J. L., Middleton, K. M., Witmer, L. M., Holliday, C. M.; 2016. 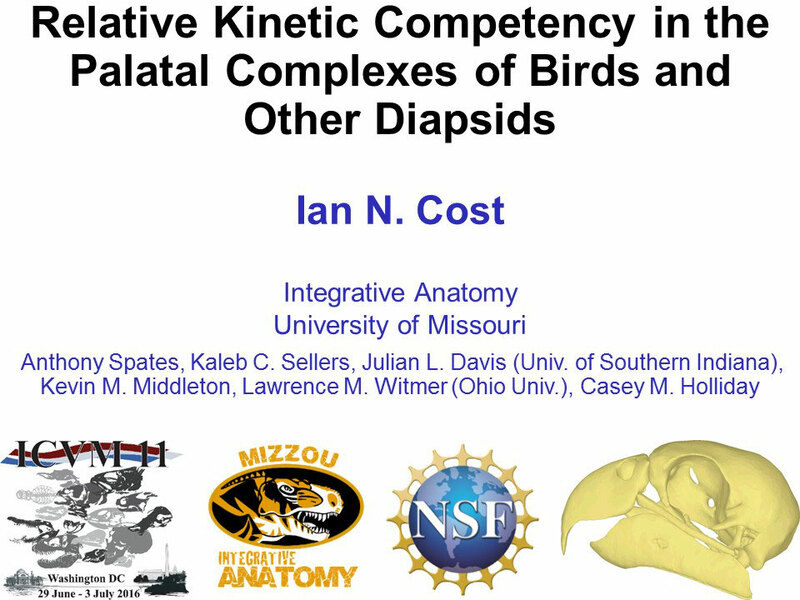 Relative Kinetic Competency in the Palatal Complexes of Birds and Other Diapsids. 11th International Congress of Vertebrate Morphology, Bethesda. Cost, I. N., Middleton, K. M., Holliday, C. M. 2018. 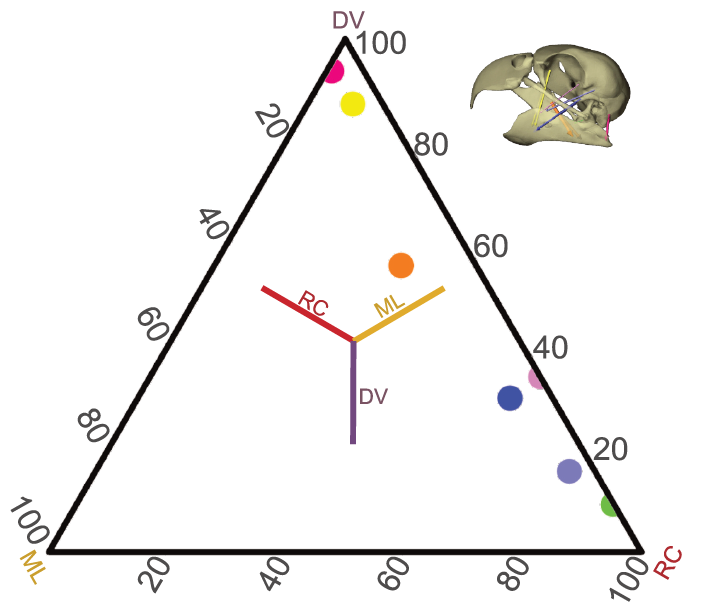 Mechanical Performance in the Skulls of Parrots (Aves: Psittaciformes). Society for Integrative and Comparative Biology, San Francisco, CA. Cost, I. N., Middleton, K. M., Witmer, L. M., Echols, M. S., Holliday, C. M. 2017. Comparative Anatomy and Biomechanics of the Feeding Apparatus of Parrots (Aves: Psittaciformes). American Association of Anatomists at Experimental Biology, Chicago, IL. Cost, I. N., Middleton, K. M., Witmer, L. M., Echols, M. S., Holliday, C. M. 2017. Comparative Anatomy and Biomechanics of the Feeding Apparatus of Parrots (Aves: Psittaciformes). Life Sciences Week, University of Missouri, Columbia, MO. Cost, I. N., Spates, A., Sellers, K. C., Davis, J. L., Middleton, K. M., Witmer, L. M., Holliday, C. M. 2015. 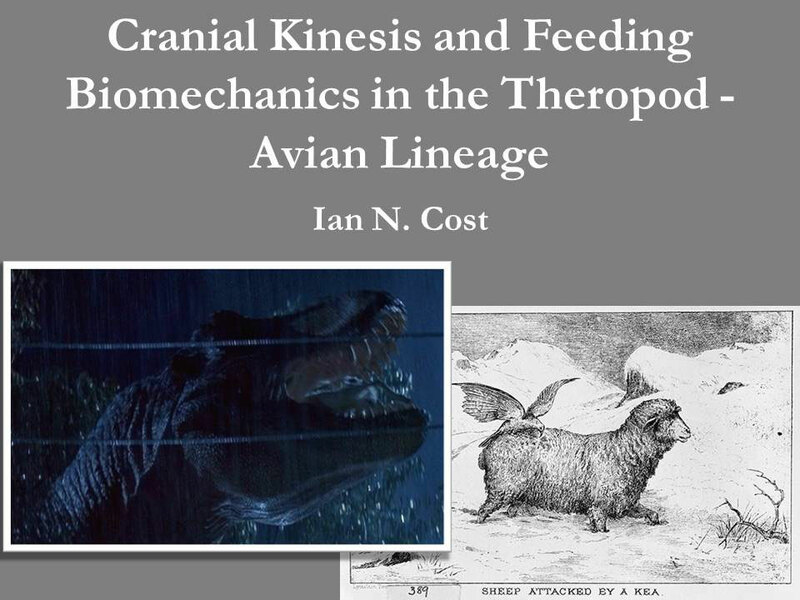 Biomechanics of the Avian Feeding Apparatus. Society of Vertebrate Paleontology, Dallas. Cost, I. N., Deramos-King, C. 2003 Analysis of Stormwater Runoff for Levels of Inorganic Anions in the Town River and South Brook of Bridgewater, Massachusetts. National Conference on Undergraduate Research, Salt Lake City. Wilken, A. T., Middleton, K. M., Sellers, K. C., Cost, I. N., Davis, J. L., Holliday, C. M. 2017. Modeling Complex Cranial Joints in Varanus exanthematicus. Life Sciences Week, University of Missouri, Columbia, MO. Sethi, A., McGechie, F., Sellers, K. C., Cost, I. N., Holliday, C. M. 2017. 3-D Reconstruction of the Muscle Architecture of Pterygoideus Ventralis in Gekko gecko. Life Sciences Week, University of Missouri, Columbia, MO. Rozin, R. E., Cost, I. N., Holliday, C. M. 2016. Feeding biomechanics in galliform birds and its significance for avian cranial evolution. 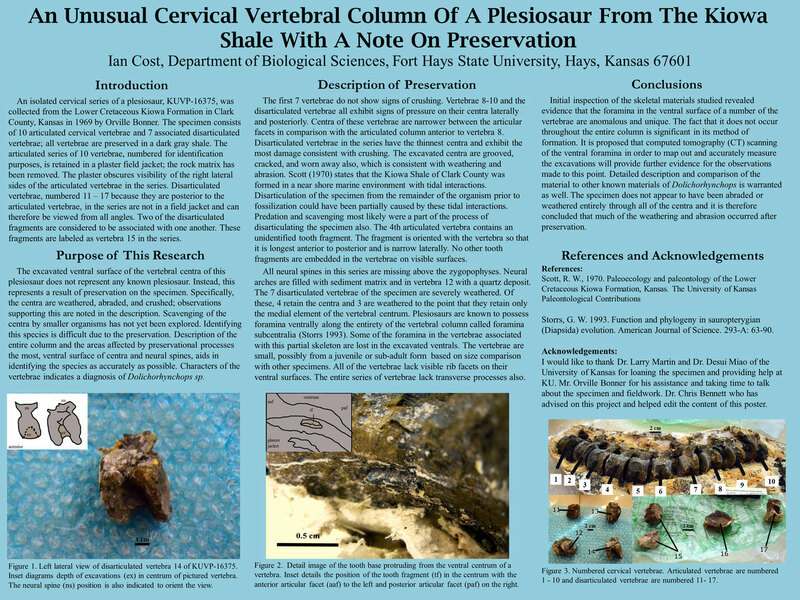 Society of Vertebrate Paleontology, Salt Lake City. Holliday C. M., Tsai H. P., Cost I. N., Sellers K. C., Lautenschlager S., Witmer L. M. 2016. DiceCT and its applications for understanding the reptile musculoskeletal system. International Congress of Vertebrate Morphology. Cooper, J., Herbst, E., Sellers, K. C., Cost, I. N., Middleton, K. M., Holliday, C. M. 2016. The Impact of Muscle Anatomy on Skull Loading in Hard-Biting Animals. Univ. of Missouri Summer REU Forum. Herbst, E., Cooper, J., Cost, I. N., Sellers, K. C., Middleton, K. M., Holliday, C. M. 2016. 3D Reconstruction of the Feeding Biomechanics of the North American Aetosaur Desmatosuchus. Univ. of Missouri Summer REU Forum. Spates, A., Cost, I. N., Sellers, K. C., and Holliday, C. M. 2016. 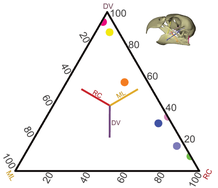 Using Novel Methods to Visualize Jaw Muscle Biomechanics and its Significance for the Evolution of the Avian Feeding Apparatus. American Association of Anatomists, San Diego.